﻿This project presents a new approach for reclaiming fens by establishing the initial stages of peatland development on mineral sediment. Created vegetation types similar to those found on mineral sediment at the base of Canadian peat cores. Examined five common fen mosses along a water table gradient and under shade cover. Successfully established distinct fen moss communities with moss production rates similar to restoration experiments on peat soils and within the variance of natural peatlands. Introducing a suite of fen moss species that inhabit a range of hydrologic niches under low shrubs or herbaceous plants improved moss establishment on clay loam. Restoring the community structure and biomass accumulation that occurs in the initial stages of fen development is feasible and may be a suitable target for peatland reclamation. Flood disturbance in peatlands can create temporary or permanently submerged areas where tolerant species may persist and replace intolerant species over time. 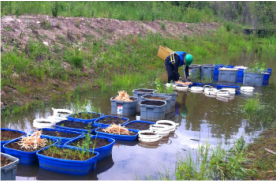 This project examines the resistance and resilience of fen moss species and communities that occur along a hummock-hollow gradient to different durations of submergence. We harvested and submerged monoculture plugs dominated by Hamatocaulis vernicosus, Sphagnum warnstorfii, Tomentypnum nitens, and Aulacomnium palustre in the field under rich fen water for 1 to 8 weeks. After submergence, we planted the plugs in bare peat at the same site to evaluate the short and long-term responses of each species and changes in moss community composition over time. We found that moss species response to duration of submergence is not strictly related to their occurrence along a hummock-hollow gradient and that tolerant species maintain or restore moss cover. Hamatocaulis vernicosus was most tolerant to submergence of all durations, whereas Sphagnum warnstorfii was nearly eliminated by submergence. Over the long-term, more tolerant species replaced less tolerant species, increasing diversity and moss community resilience. 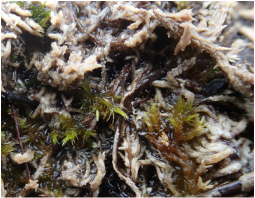 Overall, moss communities without S. warnstorfii were resilient to 4 weeks of submergence because Tomentypnum nitens and H. vernicosus maintained dominance or established where the cover of less resilient species was limited. We show that moss species varied in their responses to submergence duration, resulting in shifts in community composition and long-term effects on community resilience with greater durations of submergence. This provides insight into how mosses communities provide stability to peatlands in response to disturbance through shifts in community composition that support tolerant dominant species. Oil sands mining in Alberta, Canada has disturbed large areas of peatlands, the dominant regional ecosystem type, yet no formal strategies exist to reconstruct the landscape or its vegetation. Peatland reclamation is difficult, but approaches are now being tested to determine the feasibility of rebuilding these ecosystems. In compliance with a new provincial regulatory framework, a pilot reclamation fen and associated watershed was constructed in an oil sands mine near Fort McMurray, Alberta. In a large-scale multifactorial field experiment, revegetation efforts tested introducing bryophyte and vascular plants by moss layer transfer, seeds, and greenhouse grown seedlings under wood-strand mulch and with a Typha latifolia weeding treatment. 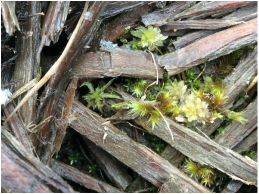 Four years after planting, the moss layer transfer with Juncus balticus seedlings treatment was most effective at maintaining fen bryophyte and vascular plant cover and richness. Weeding did reduce T. latifolia percent cover but was not necessary were fen vascular plants were introduced due to competitive exclusion. The most successful fen vascular species to establish was Carex aquatilis, which rapidly colonized the fen but reduced cover and richness of other desirable fen plants. Depth to water table also influenced species distribution, with shallow water tables supporting more T. latifolia and lower bryophyte and vascular plant richness and cover. Overall, our research demonstrates that it is possible to establish fen bryophyte and vascular species and limit T. latifolia invasion in a constructed fen. To prioritize plant diversity and bryophyte establishment, future projects should design for greater water table heterogeneity, select fen species tolerant of expected abiotic conditions, and introduce co-dominant vascular plants as seedlings. This research is the first of its kind to evaluate a range of revegetation strategies for fen reclamation. We assert that it is possible to restore fen peatlands in the post-mining landscape of Alberta, and that despite the constraints, a range of successful outcomes are achievable. 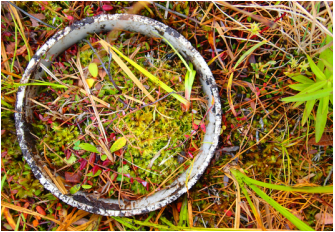 Moss establishment is a key step in reassembling boreal peatland communities as they are important peat-formers and dominant ground cover in Alberta peatlands. Mosses were introduced to the constructed fen using the moss transfer method (Quinty and Rochefort 2003). This method involves collecting 5-10 cm of surface vegetation consisting of moss and plant propagules (seeds, spores, roots, leaves, stems etc.) that can regenerate into new individuals. The collected sections are shredded and evenly spread over the peat surface of in the constructed fen at a ratio of 1 m2 of field collected turf to 10 m2 of transfer area and under cover treatments of wood-strand mulch and seedlings . Moss establishment in the constructed fen varies in response to cover treatments, hydrologic and geochemical variation. Limited cover, long periods of inundation or drought, and high salinity levels impede moss establishment. We are testing establishment along these gradients to describe thresholds for reclamation initiatives. Oil sands mines in Alberta, Canada remove entire surface landscapes, the vast majority of which are fen peatlands. After years of marsh wetland mitigation, regulators mandated for producers to begin testing methods to reclaim peatlands following mine closure. Two pilot fen projects were constructed to mimic natural regional fen ecosystems and consider the constraints of a post-mining landscape. Though the two designs differed, similarities emerged and the vegetation data was synthesized to extract commonalities and inform future fen reclamation efforts. Of all the introduced and opportunistically established species in both fens, the most abundant species is Carex aquatilis, but wetter and drier communities of undesirables have established that are dominated by Typha latifolia and Calamagrostis canadensis respectively. Ptychostomum pseudotriquetrum moss established across a wide range of water levels regardless of vascular cover, whereas the desirable introduced moss Tomentypnum nitens persisted only under Juncus balticus cover and where the water table was less than 10 cm from the surface. These trends will be used to refine reclamation methods that optimize environmental conditions and plant introductions to produce fen communities with high production, diversity and resilience. As the headwaters to many major watersheds, Colorado’s forests provide vital hydrologic functions and store significant amounts of carbon. A large amount of carbon is sequestered within forest soils, with the greatest carbon density occurring in peatlands. Peat accumulating wetlands occupy a small proportion of Colorado’s landscape, yet provide significant hydrologic and carbon sequestration functions. The role of peatland restoration on these functions within Colorado’s forests remains understudied, largely because long term datasets on restored wetlands are lacking. Our research addresses the need to increase our understanding of carbon storage and hydrologic functioning of restored peatlands of Colorado’s mountain forests. 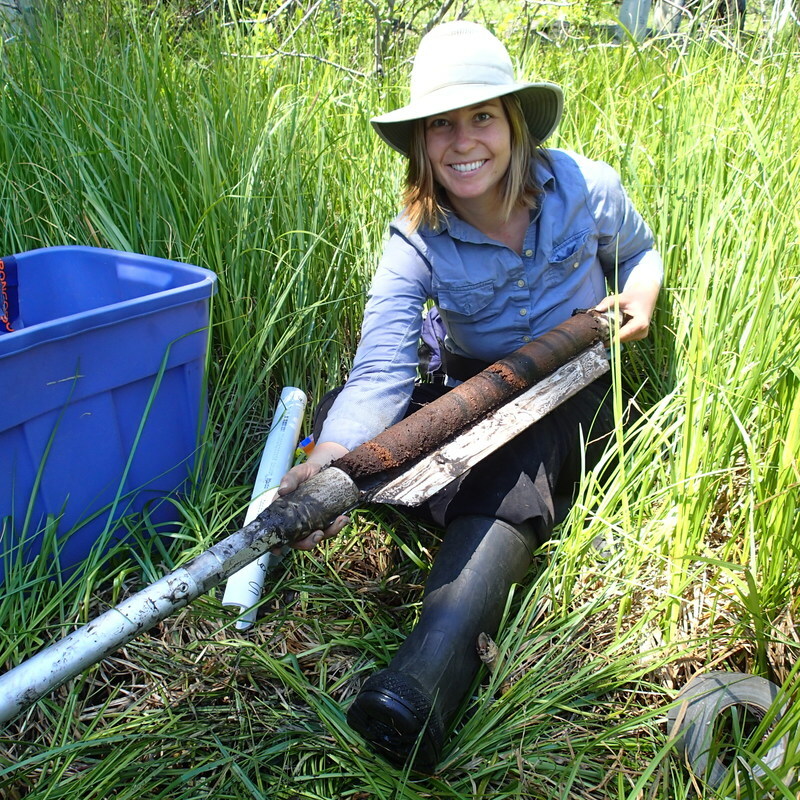 Our objectives focus on understanding the contributing plant species and hydrologic conditions that support peat accumulation in Colorado’s restored fens and the potential for fen initiation from wet meadow wetlands. Our research objectives include: 1) documenting patterns in initiation and succession of regional reference fens, 2) examining the composition of peat-forming communities and successional development in restored fens and wet meadows, 3) determining the amount of carbon accumulated in restored and reference fens; and, 4) examining the importance of hydrologic conditions in controlling patterns of fen and wet meadow development.